HOUSTON, TX (November 13, 2017) - Having experienced all levels of competitive golf, Courtney McKim, 27, is in a unique position to define the differences between college, professional and amateur life. There’s a certain vibe that exists among middle-aged elite golfers – there’s the ability to break bread together, correct even your opponent’s swing on the driving range, and generally help each other toward a common goal. “You’re all rooting for each other,” McKim said in summary. McKim, who lives in Raleigh, N.C., is competing this week in her third U.S. Women’s Mid-Amateur. She took the No. 17 seed on the match-play bracket, and ran into women’s golf stalwart Laura Coble on Monday. McKim was able to outlast Coble at Champions Golf Club, taking advantage of Coble’s rare mistakes late in to the round to win the match in 19 holes. If Coble’s an expert at this life – this is her 30th USGA championship and she was runner-up here eight years ago – then McKim is quickly figuring it out. There’s a kind of art to balancing your golf game and your day job, and that’s one of the unique challenges of mid-amateur golf. McKim says players sometimes pick each other’s brains about the best way to go about that multi-tasking. McKim has been in the real world since graduating from the University of Alabama in 2014 and starting work for a London-based company called Convatec. McKim works remotely, doing the company’s real estate and purchasing work. Most co-workers don’t realize that when she takes vacation, it’s to play golf. In the rare event that someone does figure out McKim’s deep background in the game, the first question is usually to see her national championship ring. 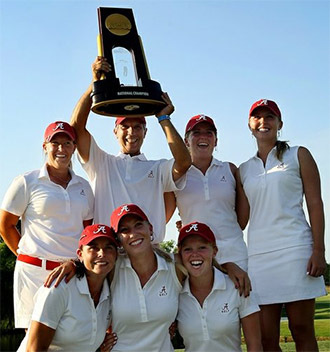 McKim was on the Alabama squad that won the NCAA Women’s National Championship in 2012 – a first (and so far only) title for that program. An NCAA national championship is a universal language, though, and McKim is learning that. She still remembers standing on the final green at Vanderbilt Legends Club in Franklin, Tenn., and listening to her mom explain how this moment would change her life. “You don’t realize what this will do for you, and the social circle that it will bring you into,” Beverly McKim told her daughter. Five years later, Courtney says she was exactly right. After graduating, McKim had a hard decision to make. She watched many of those Alabama teammates – and other college-golf acquaintances – turn pro and navigate LPGA Q-School, the Symetra Tour and beyond. McKim, meanwhile, began working for Convatec three months after graduating. She had to figure out what golf would mean to her in the next stage of life. There was a period of figuring out how much practice it took to maintain her game (something she’s still experimenting with) and how to enjoy the experience. “You find your love for the game again,” she said. This week, McKim may still be on a high from her summer golf “vacation.” When McKim took days off in August, it was to go to California for a week of qualifying. She played the qualifier for this week’s event first, then three days later teed it up in the first stage of LPGA Qualifying School at Mission Hills Country Club in Rancho Mirage, Calif. She advanced through that stage by one shot, but didn’t get through the second stage in Florida last month. The decision to play Q-School had been marinating for years. With the format of LPGA qualifying expected to change in coming years, McKim figured her chance to test her mettle was running out. She didn’t want to find herself with regret later in life. “I wanted to go because I didn’t want to look back in 10 years and think, ‘What if I had gone? Could I have gone? Do I have what it takes?’” she explained. Ultimately, McKim knows she’s exactly where she belongs. She loves the mid-amateur circuit, and she has the game for it. She’s a face we’ll be seeing for awhile.